Amazon has released Lumberyard 1.15, the latest beta of the game engine and development environment, adding new River and Road components, and extending pose blending in the EMotionFX Animation Editor. 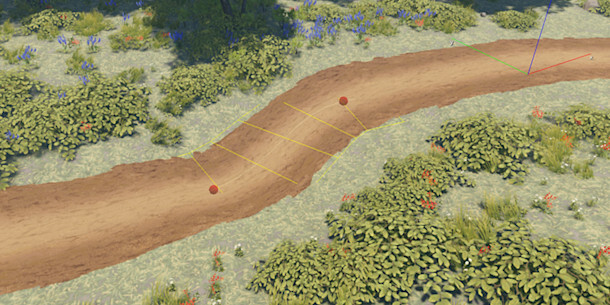 The update adds new components for roads and rivers to the component entity system, Lumberyard’s system of readymade modular content for generating common game elements. The River component is based on 2D textures, and is really intended “to create flat rivers along level terrain”, but it supports the option to have physicalised objects move with the water flow. The Road component comes with options to fit the road to the curvature of underlying terrain, or vice versa. Both have settings to erase surrounding vegetation up to a user-configurable distance from their edges. EMotionFX, Lumberyard’s animation editor, gets new Blend Two Additive and Pose Subtract Nodes for adding or subtracting a second pose from from a base pose. The system supersedes the old Blend Two node, which has been retained for backwards compatibility. Non-graphics-related changes include four new Cloud Gems: readymade modules for handling common online tasks. These include gems for collecting analytics data, reporting defects during QA testing, and sending computationally intensive tasks like lightmap baking or terrain generation to Amazon’s EC2 cloud. The update also introduces a new cross-compiler for converting HLSL shaders to Metal. It runs on macOS, removing the need to use a Windows machine when generating Metal shaders for iOS and macOS. Lumberyard also now supports Visual Studio 2017, the latest version of the IDE. Lumberyard 1.15 is available now. The editor runs on Windows 7 and above.